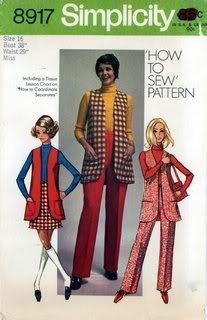 I was processing patterns (something I do an hour or two each day), and I came across this one - Simplicity 7607. This was simple to process, just four small pieces and a page of instructions. Super simple beginners pattern. Then as I was recording the envelope condition the words caught me -- Paula Hundle 4th Hour. And there I went .... back to 1970. Typing so that I would have something to fall back on later when my husband left me and I had children to support. And sewing and typing it was. But, this entry is about the sewing .... I'll tell you about the typing some other time. So, sewing it was. The class (about 15 or us per period, I believe), had an assigned pattern to make. It was for a skirt and vest combination. It was this pattern - Simplicity 8917. Mom and I went shopping for the pattern and materials. Shopping for us was always a painful experience, we never agreed on much and she liked to look at everything and I was more the grab the first thing and dash kind of person. Finally, 'we' selected a white, brown and red plaid type fabric. I'll never forget it. And then, for a couple months, about 45 minutes each period, we discussed sewing, learned to use the machine, cut out the tissues, finally the fabric and then began stitching it all together. I don't remember hating sewing class until the day, when we were almost done, the teacher made her big SURPRISE ANNOUNCEMENT. All the sewing classes, who were making the same pattern, were going to have a BIG FASHION SHOW in the Auditorium. in front of THE ENTIRE SCHOOL. Now, what I've failed to mention, was that I was SHORT, overweight, PERHAPS FAT, with RED HAIR and FRECKLES that led a life of their own all over my face and arms. Or, in other words, I would rather have died than paraded in that plaid outfit, that made we look like a brick firehouse. As the day approached, I tried to explain to Mom that I couldn't do it. Everyone would tease me and I would be humiliated, but she gave me the typical OVER REACTING line, and went back to napping through Merv Griffin. Each day dragged slowly by as we mastered the zipper and the hem. (Did I mention the days dragged by). And then, the end of the semester happened; just like I knew it would. It dawned a bright and sunny day, of course. Fortunately, Mom had to work and wasn't able to to come to our fashion show. The morning lasted an eternity. And then, right after lunch, all of us 'sewing class' girls went to the gym and put on our outfits and proceeded to the auditorium (aka cafeteria). Now, I suppose that I wasn't the only girl not looking forward to this. But I don't really know. I didn't have any friends in the 7th grade; they were not something Mom looked favorably upon. I now wish I had a picture to show you; but to my knowledge, one was not taken. We were lined up single file, and one by one, about a minute apart, we walked out onto the stage, made a turn around, and walked to the back where we were set into rows. When my turn came, I dragged out. There were of course, some laughs, and a few mean remarks hurled towards the stage by the up-and-coming guys and hip girls. I wanted to die, but I made back to my spot in the rows. And then, it was all over and we were dismissed to go back to the gym to change. I went home instead. School never asked why I didn't go to afternoon classes, and Mom didn't remember at all, but just came home and snoozed through Merv Griffin. I never took another sewing class. Which brings me back to Simplicity 7607. 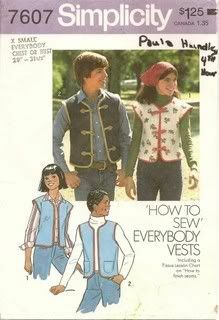 Other than being slightly dogeared, the pattern is in perfect condition and awaiting some beginner sewer wanting to make a slightly mandarin looking vest. Who-ever you are Puala Hundle, I hope it was an okay experience !